WINSTON-SALEM, NC - AUGUST 24: Alexandr Dolgopolov of the Ukraine returns a shot to Grigor Dimitrov of Bulgaria during the Winston-Salem Open. WINSTON-SALEM, N.C. (AP) -- No. 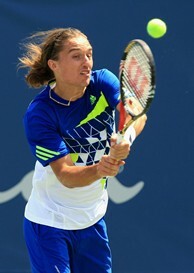 3-seeded Alexandr Dolgopolov advanced to the quarterfinals of the Winston-Salem Open on Wednesday. The Ukrainian defeated Bulgaria's Grigor Dimitrov 6-4, 1-6, 7-6 (7) in the third round of the final men's tuneup before next week's U.S. Open. He will face the Netherlands' Robin Haase in a quarterfinal Thursday. Haase defeated Pierre-Ludovic Duclos 6-4, 7-5. No. 9-seeded Sergiy Stakhovsky upset No. 5-seeded Nikolay Davydenko 6-4, 6-4 to reach the quarterfinals. He will face qualifier Julien Benneteau. The Frenchman beat Russia's Igor Andreev 2-6, 6-1, 7-6 (5). The only two Americans left in the tournament were playing later matches. Top-seeded Andy Roddick was facing No. 15-seeded Santiago Giraldo, and No. 4-seeded John Isner of Greensboro was taking on No. 13-seeded Jarkko Nieminen.